England had a less than comfortable win against a brave Italian side in the RBS Six Nations clash in Rome. England managed to beat Italy with a narrow 17-12 score line. A brace of penalties apiece from Jonny Wilkinson – who missed three kicks in all – and Mirco Bergamasco made it 6-6. Mathew Tait’s fine try early in the second half put England ahead before Wilkinson slotted his third penalty. Italy trimmed the lead through two Bergamasco penalties, but Wilkinson’s drop-goal soothed England nerves. Italy who have been blamed for negative play and only defending a narrow scoreline in prevous matches played with positive intent of their own and when Alessandro Zanni claimed Craig Gower’s cross-kick, Italy came desperately close to the first try of the match. England captain Steve Borthwick claimed two Italy throw-ins in quick succession to halt the hosts’ momentum and help set up the platform for Wilkinson to open the scoring with a penalty. Italy hit back in similar fashion through Bergamasco – not regarded as a front-line Test goalkicker – straight after the restart when Nick Easter was penalised for not releasing after making a tackle, before a remarkable Wilkinson run came to an end. The visitors had a let off as Bergamasco’s radar also went awry but after some bright moments in attack England had begun to lose their way and after they came off worst in the latest of a series of increasingly tedious kicking duels, the Italy wing landed his second penalty to give the Azzurri a 6-3 lead. With Italy’s strength lying in their forwards, England’s clearest advantage was out wide but their fear of running the ball from their own half – surely under orders from the England coaching staff – was hampering their efforts to develop any attacking momentum. Italy levelled the scores through a Bergamasco penalty straight after the restart before England cut loose with a cracking try as Easter, Ugo Monye and Armitage combined to send Tait racing over. Wilkinson’s struggles with the Mitre brand of ball continued as he missed the conversion but England were looking much more positive when they had possession. But England could not take advantage of the Leicester tight-head’s absence and Italy even managed to reduce the lead as Bergamasco landed his third penalty. Any signs of life from England had by now disappeared and the game had turned into a real dog fight, with the hosts on top. 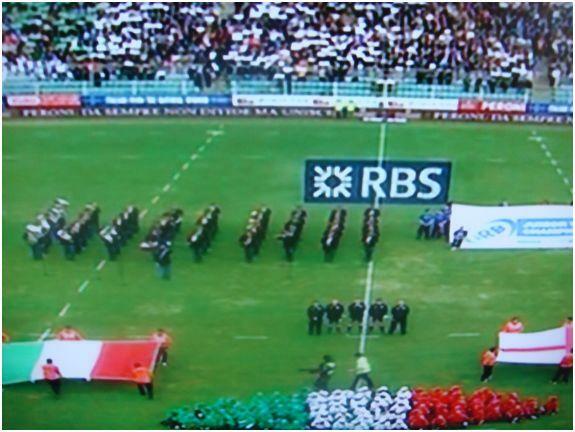 Italy: McLean; Masi, Canale, Garcia, Mi Bergamasco; Gower, Tebaldi; Perugini, Ghiraldini, Castrogiovanni, Geldenhuys, Bortolami, Sole, M. Bergamasco, Zanni. Replacements: Ongaro, Aguero, Bernabo, Derbyshire, Canavosio, Bocchino, Robertson. Replacements: Thompson, Wilson, Mullan, Deacon, S. Armitage, Hodgson, Flood.